When did businesses start building relationships with their customers? You’d be forgiven for thinking, what an odd question. Isn’t that obvious? Isn’t the answer, “forever”? Yes! Of course it is. 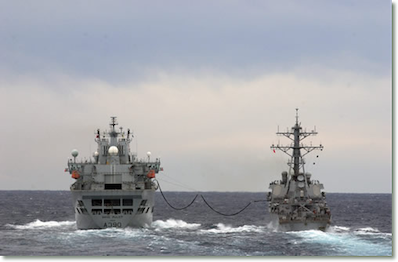 To not build a relationship with your customers is akin to, well, let’s just say it would be unusual... As with the picture of this US Navy destroyer, however powerful or big you are, working together (building relationships) is essential for success. In this case we can see the destroyer is connected to a Royal Navy fleet support vessel for re-fuelling. So, when did businesses start wanting to build relationships with potential customers? And why is everybody focusing on this thing called content marketing these days? It’s the same answer: businesses have always recognised that building relationships with potential customers is part of the process of winning customers. Building relationships relies on certain elements to be present, key amongst which is trust. So, how do businesses win the trust of potential customers? The media has played a critical part in this process. From print advertising to radio advertising to TV advertising then online banner adverts and most recently, online content marketing. As we move along a timeline of marketing there is an inversely proportionate relationship between cost and number of people reached. In other words, as new techniques and technologies emerge, so the cost per person reached falls. But what is Content Marketing? Offering high quality content is an increasingly popular method of trust and relationship building. For example, Red Bull produce a magazine about action sports which is circulated to 2 million people a month. That’s a lot of brand building, but it relies on top quality content to work. The media team at Red Bull were given the brief of producing a magazine that would be good enough to be a revenue stream in its own right. By setting the bar high, Red Bull achieved a reputation that must have left competitors in the energy drinks market somewhat envious. Have you searched ‘content marketing’ on google yet? Here’s a graph showing the rise in interest in the term ‘content marketing’ on google from 2005. If your new graph isn’t quite as 'up and to the right' as the one above, perhaps a spot of content marketing should be on the cards. Do you run CPD seminars, or give presentations to prospective customers, or talk at conferences, or have access to other content that you have already created about your product or service? Would you be interested in re-using that content to help generate new leads for your business? If your company signs up to Coracle’s Learning Line platform, we’ll put together a bespoke course (based on your content) for free to help get things going for you. A GUIDE TO THE MEDIA: PREPARING FOR PRINT, PROGRAMMES, PODCASTS AND PIXELS. This course covers it all. From tips on TV interviews to advice on choosing your social media channel, staying safe online and crafting a press release, this course offers the background you need to negotiate a world in which everyone is the media. This Supply Chain module looks at what Ethical Business is, why it is important and how your business can adopt Ethical Business practices. Shipping is the thread that binds together raw materials, processing and the clothes we wear, the cars we drive and the houses we live in. This course is designed to help you get a quick grasp of the most significant areas, cities and ports of world shipping. The module focuses on the production and transport of raw materials. To recap, when your company signs up to Coracle’s Learning Line platform, we’ll put together a bespoke content marketing course for free! Sound like a good deal? Value of free bespoke course. Whilst the course spec will be agreed with you, there is a maximum value contribution from Coracle which equates to 3 days work.